We welcome your feedback about this story. 1 Once upon a time not so long ago, a young princess lived in an enormous palace. Princess Athena looked like a Roman cameo. She had clean-cut features, sleek, black hair, and piercing, ice blue eyes. Unfortunately, her temperament did not match her beauty. She was only ten, but she required the best of everything. Her exhausted attendant worked day and night to satisfy the spoiled princess. 2 "Fix my hair!" the princess demanded in an irascible voice, and the attendant ran to get the gilded brush, comb, and jeweled mirror. 3 "Ouch! Don't pull so hard!" the princess screamed, as if she was in the throes of agony. 4 "Brush harder than that!" the princess said after a moment. "My hair won't shine unless you apply enough pressure!" 5 The poor attendant hardly knew what to do, so she tried to brush a little harder. The princess finished putting on a pink, silk dress with matching hair ribbons. She then ran out to the garden to play, and her attendant sighed with relief. Her attendant kept her distance while the princess played, and she gossiped behind her back in a devious tone. After all, the princess treated her terribly! 6 The garden had gentle hills with winding paths. Groves of trees provided shade, and vivacious peacocks strutted about showing off their huge tails. Goldfish and frogs hid under the lily pads in a small pond. 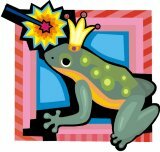 One of the princess's favorite things to do was catch frogs. She pretended they were her pets. Their bright, round eyes and smooth, green skin delighted her. The garden was the only place that the little girl could play alone because high walls surrounded it. Today, however, the princess had a shock. 7 "What are you doing in my private garden?" the princess demanded. 8 "I am your fairy godmother. You have caused trouble for the Fairy Godmother Council! They do not approve of your arrogant attitude," said the woman, who wore glistening, white robes. "I pulled quite a few strings so that you could be born with great beauty, but you have disappointed me!" said the woman, and then she muttered, "Why didn't I just stick with Cinderella? If I fail to reform you, my cell wand rates will go up!" 9 She stepped closer to Athena. "You are unfit to be a princess, and I must take a drastic measure to teach you a lesson. I had decided to relinquish your account, but the council asked me to take it back because of my precision in changing humans to creatures," said the godmother in a languid voice.